Sometimes you might want to create additional schedule pages, especially if you have sets of events that have different audiences - e.g. a one-off conference versus your regular drop in classes. Each of the schedule pages will have their own, independent public URL. Additional schedule pages are only available on Standard (and above) plans. You have to be an account owner in order to be able to add a new schedule page. Click on Account, then Schedule pages. Click Add a new schedule page. You now have a new schedule page! 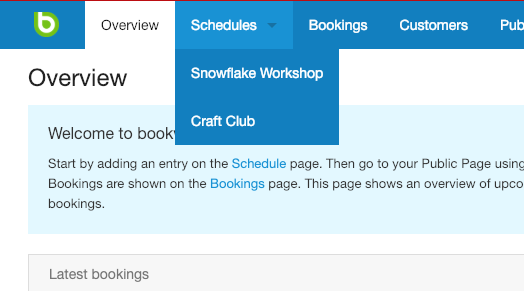 You'll see that by hovering over the Schedules or Public Pages buttons at the top of your screen, you can select which of your schedules to view. If you ever want to edit the public url of any of your schedules then click on its public page. From here click Page Setup then Change your page URL... button.